This model is produced by Lensmam (the Seeshell manufacturer). feels like normal prescription lens very comfortable and did not feel any discomfort wearing them for a long period of time, did not feel drying or like it lacked oxygen to my eye so I am very pleased with this lens regarding to comfort! I like it~ mostly cause this pair is really comfortable! they look so pretty on you!!! your eyes are gorgeous ^^ & lashes too. you look gorgeous ^^ the lenses really match your hair~ i have that cosmagic product too but i have no idea how to use it >< can't wait for your review!! the lenses look beautiful on you! it matches with your hair as well! pretty! The name for this series is spot on. They do look like cat's eyes! 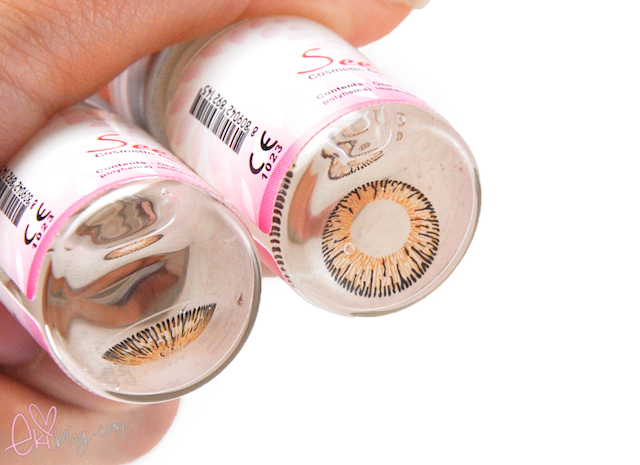 These are some of the prettiest multi-color lenses I've seen since Princess Mimi series. They looks so pretty on you! you have such long lashes!!! Those look absolutely GORGEOUS on you ♥ & I think I need that eyebrow mascara in my life, haha! Those lenses are so pretty! I agree with you. I like how these lenses look from far away, but up close I dislike the line designs. Such a shame - it's a beautiful color. you always have such pretty eyes!! You look so adorable with your hair in a braid!! hi eki! what lipstick/gloss are you wearing here? u look gorg! Lovely lenses. The design is definitely unique...but they look nice on you! I love how the lens match your hair colour! Amazing! wow, I need this eyebrow mascara!! well my hair is light red but i use the Etude one in light brown and doesn't make me happy because is not that fair like this one that you use. I reeeally like this one *___*. Sorry fot comment other thing here but what happened to the blog mymakeupreviews.blospott.com ????? I kind miss Jojoba =/ sad =~~~ /. Anyone knows something?? You look sooo lovely...the lens complement your hair color and everything. I love the lens' color. You look so pretty Eki! I'd love to see you do some hair tutorials =) Your hair is always so nice! aww thank you for stopping by and reading my blog! your kind words made me happy!! Its all good that you are not into gal style hehe ^__^ thanks for being sweet! thank you! Happy blogging Hun! super nice! ilove it much! Really like the design of these contacts, the lines are interesting!